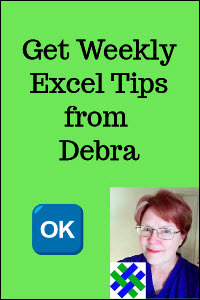 How to set up the criteria range for an Excel Advanced Filter. For basic information, see the introduction to Excel Advanced Filter page. The samples on this page assume a data layout as shown below. The database is in columns A:D and the Excel advanced filter criteria range starts in cell F1. Note: When you use a formula as the Excel advanced filter criterion, leave the heading cell blank, or use a heading that does not match any of the table headings. There isn't a built-in Top 10 feature for Advanced Filter, but you can use the LARGE function in the criteria, to find rows with the highest values. The LARGE function returns the fifth largest value in the range D2:D28. An absolute reference is used for the range -- $D$2:$D$28. In this example, the filter will extract the five records with highest totals, for records that were entered on or after a specific date. If you download the sample file, there is also an example for finding the highest totals within a specific date range. The LARGE function returns the fifth largest value in the range D3:D29, for dates on or after Feb 3rd. An absolute reference is used for each range, such as $A$3:$A$29. NOTE: This formula is arrayed enterd (Ctrl+Shift+Enter), to create a LARGE IF formula -- it returns the 5th largest total for the records IF the date is greater than Feb 3rd. In the screen shot below, the top five records with dates on or after Feb 3rd are in the filtered results. In each record, the Order date is compared to the Ship date. A relative reference is used for this -- C2 and D2. Rows where the dates are equal pass through the Excel advanced filter. To see the steps for creating an Advanced Filter for unmatched amounts in a row, please watch this short video. The written instructions are shown below. In each record, the Invoice amount is compared to the amount Paid. A relative reference is used for this -- C2 and D2. Rows where the amounts are not equal are displayed. The FIND function looks for the string "8" in the contents of cell C2. If it finds the number, the result is the location of the number in the string. If the number is not found, an Error is the result. In each record, the value in column C is checked. If it is an empty string, the record passes through the Excel advanced filter. The COUNTIF function is used in the Criteria range, to check each record, and test for the list items. Rows with an exact match are returned in the filter. Written instructions are below the video. NOTE: To filter the results to a different sheet, start the filter from the destination sheet. See the details here. In Column I, enter the list of items that you want to match -- Bread and Cookies, in this example. F1: Criteria Heading -- "Total"
In each record, the value in column C is checked. If it is in the list in column I, and the total is greater than 1000, the record passes through the Excel advanced filter. The SUMPRODUCT and COUNTIF functions are used in the Criteria range, to check each record, and test for the list items. Rows that contain an item in the list, anywhere in the Product cell, are returned in the filter. Name the list of items in the table. In this example, the list is named FindList. In each record, the value in column C is checked. 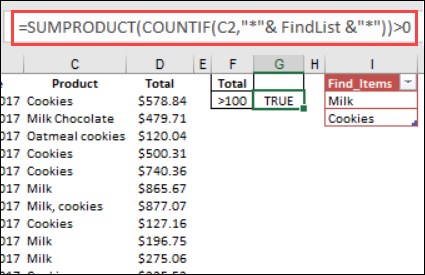 If it contains an item from the list in column I, and the total is greater than 100, the record passes through the Excel advanced filter. 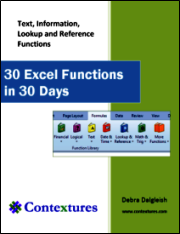 For a zipped workbook with sample data and Excel advanced filter criteria, click here.